In highschool, I took it upon myself to learn how to enjoy scream-y music. It started innocently(?) enough with slightly-abrasive-but-still-pretty-tame Linkin Park, and moved on to Refused and Underoath, and somehow, Cap'n Jazz. It was a lot of work, but tracks like Deafheaven's Dream House make it all worth while. 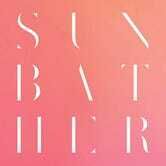 For all the screamy-type tunes I've forcibly acclimated myself to, I've also listened to a lot of substantially mellower post-rock, and Deafheaven is the almost impossibly perfect marriage of the two. If you run in hipstery music circles, you may already be aware of "Dream House"'s greatness. The only way to really get a feel is to listen to the song above, but picture this: a metal-dude screaming out his eternal soul, and behind it, not only the double-bass-peddle madness and frenzied strumming you've come to expect from your metal, but also swelling, instrumental post-rock crescendos that are primal—simple, vulgar—enough for everyone to enjoy, not just the seizing, esoteric metalhead.